Here's our complete guide to armor in Monster Hunter World, including how to forge and upgrade it, as well as the best armor sets in the game. Your Monster Hunter World armor is always going to determine whether or not you're left standing after even the lightest of attacks from a monster. 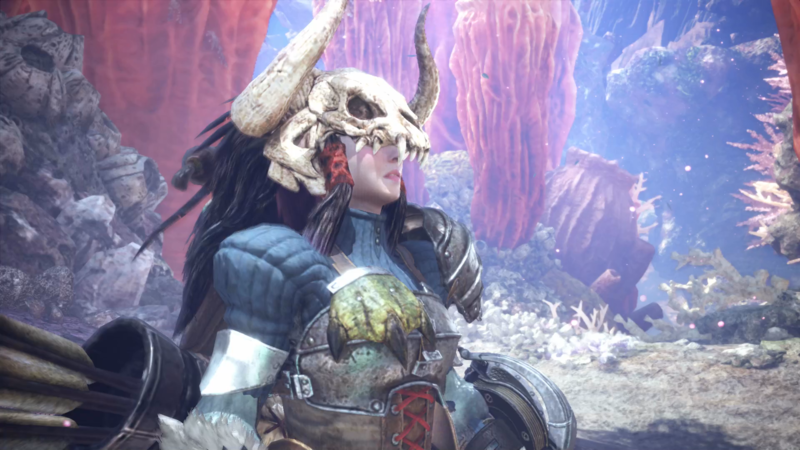 In this Monster Hunter World armor guide, we'll be pointing you to the single best Monster Hunter World armor outfit in the entire game, as well as outlining how to unlock Monster Hunter World High Rank armor in MHW, so you can keep pace with the increasingly difficult quests and monsters. If you should instead need anything else on MHW, including how to use the Scoutflies to track monsters, as well as how to customise your quick access items, head over to our Monster Hunter World guides walkthrough hub. 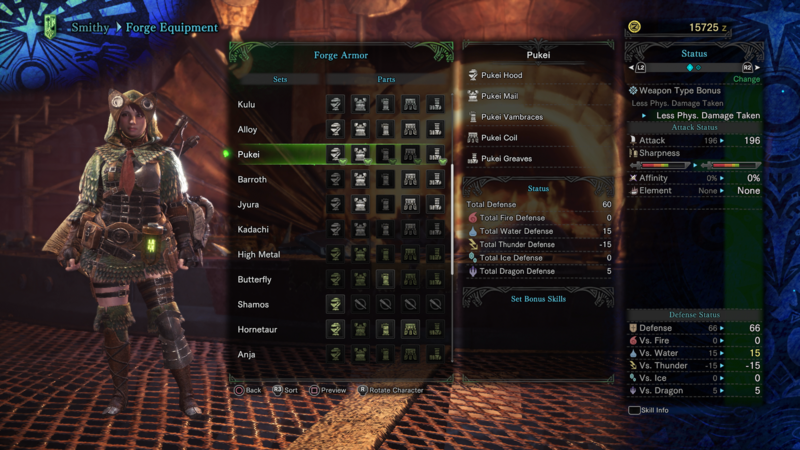 Monster Hunter World armor sets are comprised of five items: headgear, mail, gloves, belt, and trousers. 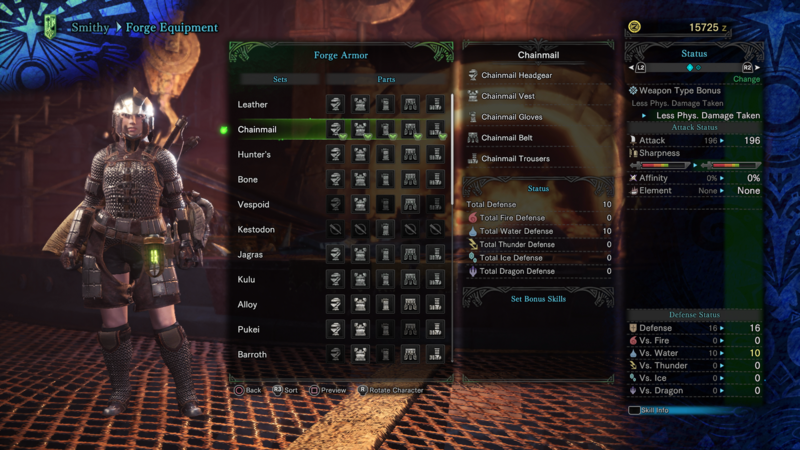 At the start of MHW, you’re limited to the option of two sets: Leather, or Chainmail. 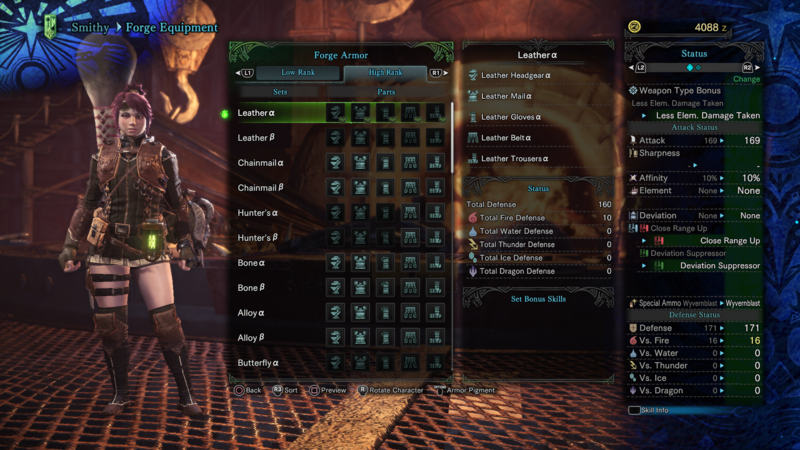 MHW Leather armor - Strong against Fire. MHW Chainmail armor - Strong against Water. MHW Hunter’s armor - Strong against Fire and Water. 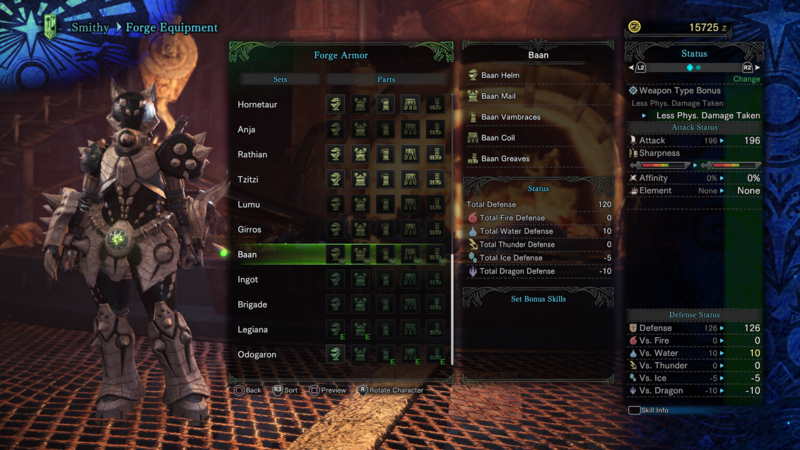 MHW Bone armor - Strong against Fire, Thunder, and Dragon. MHW Kestadon armor - Strong against Fire. 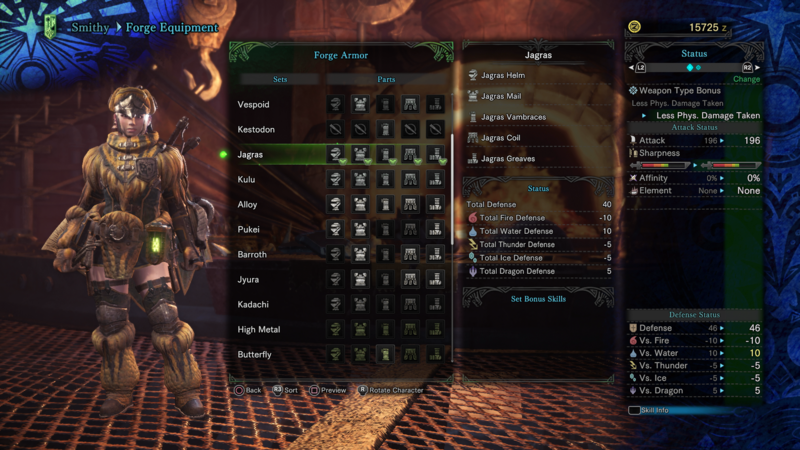 MHW Jagras armor - Strong against Fire and Dragon. MHW Kulu armor - Strong against Fire and Ice. MHW Alloy armor - Strong against Water and Dragon. MHW Pukei armor - Strong against Water and Dragon. MHW Barroth armor - Strong against Thunder. MHW Jyura armor - Strong against Water and Ice. MHW Kadachi armor - Strong against Thunder. 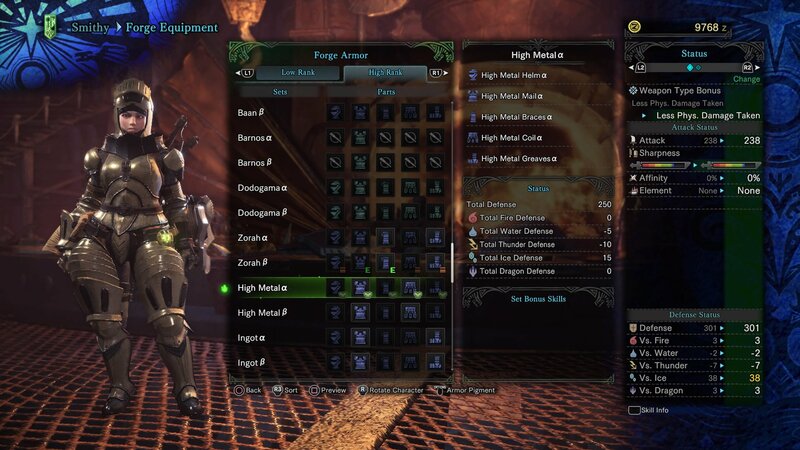 MHW High Metal armor - Strong against Ice. MHW Anja armor - Strong against Fire. MHW Rathian armor - Strong against Fire. MHW Lumu armor - Strong against Water and Ice. MHW Girros armor - Strong against Thunder and Dragon. MHW Baan armor - Strong against Water. MHW Ingot armor - Strong against Thunder. MHW Legiana armor - Strong against Ice and Water. MHW Odogaron armor - Strong against Fire and Water. MHW Rathalos armor - Strong against Fire, Water, and Ice. MHW Diablos armor - Strong against Fire and Dragon. MHW Kirin armor - Strong against Thunder and Dragon. MHW Dodogama armor - Strong against Fire and Dragon. MHW Zorah armor - Strong against Fire. MHW Uragaan armor - Strong against Fire and Thunder. 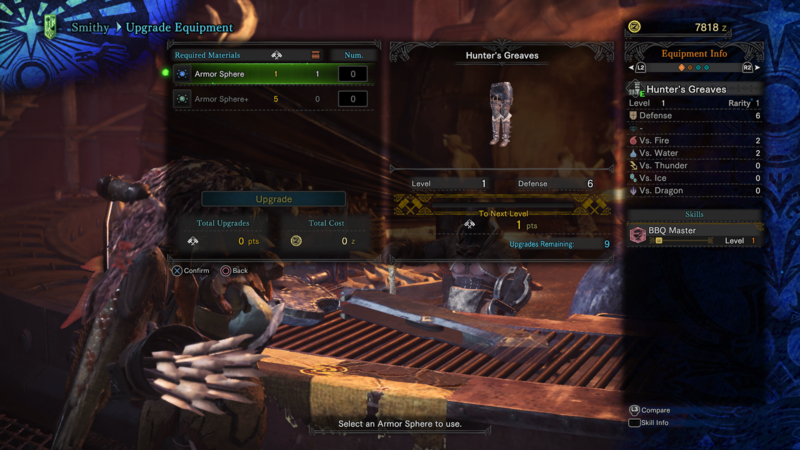 MHW Damascus armor - Strong against Fire. MHW Dober armor - Strong against Dragon. MHW Death Stench armor - Strong against Fire, Water, and Ice. MHW Nergigante armor - Strong against Water and Ice. MHW Teostra armor - Strong against Fire, Thunder, and Dragon. MHW Kushala armor - Strong against Water and Ice. 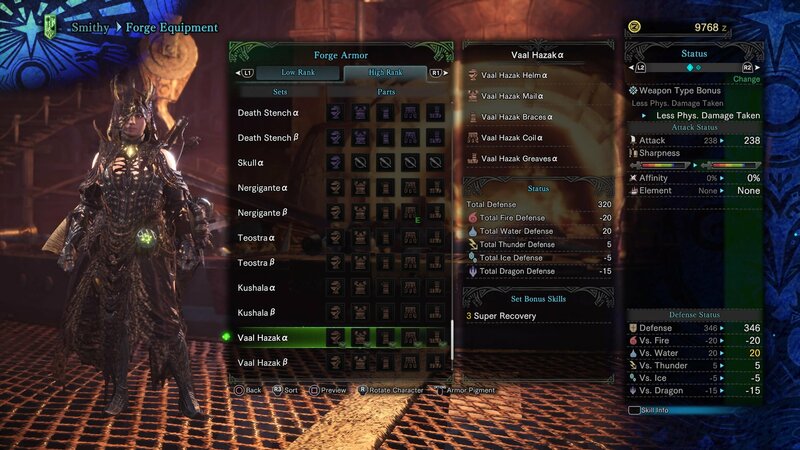 MHW Vaal Hazak armor - Strong against Water and Thunder. MHW Xeno'jiiva armor - Strong against Water, Thunder, and Ice. You unlock the ability to forge each of the above Monster Hunter World armor sets at the Smithy by defeating the respective monsters. 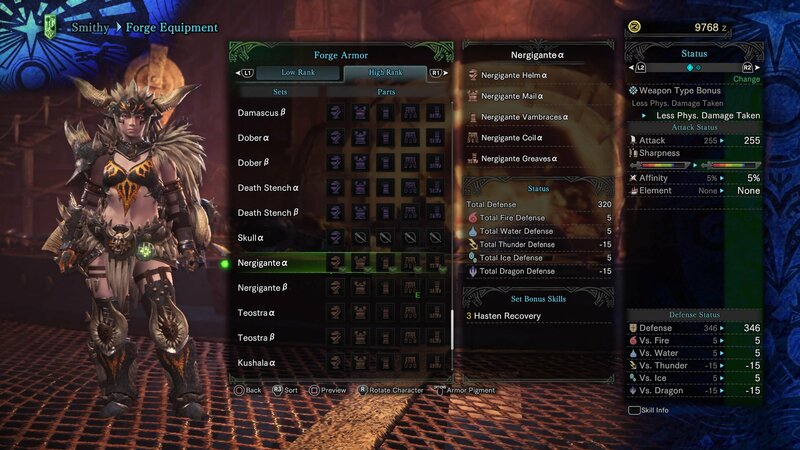 For example, to forge the Anja gear you’ll need to kill an Anjanath, and to unlock the Jagras gear you’ll need to hunt down and defeat a Great Jagras. 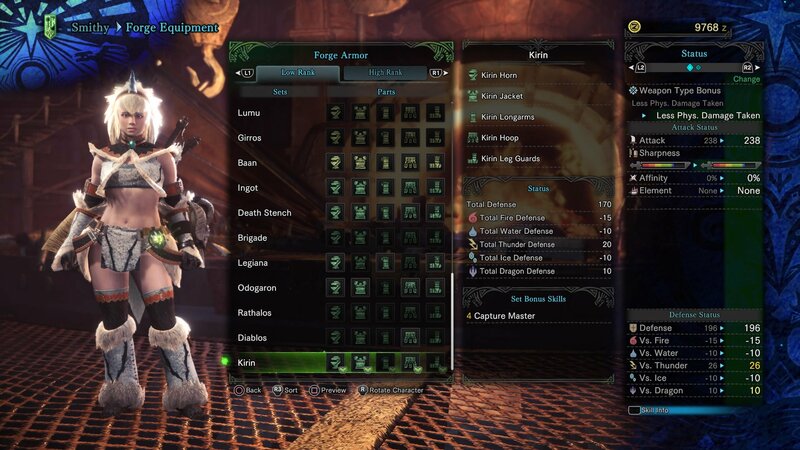 You can mix and match different items from different gear sets, so you could have a Anja Helm, with Jyura Mail, Barroth Vambraces, Chainmail Belt, and Alloy Greaves. It’s best to properly assess your target monster before deciding on which gear set to go with. 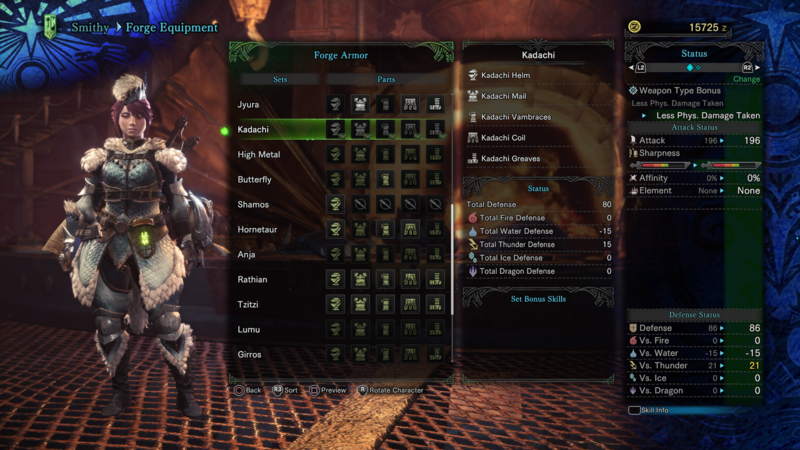 If you’re taking on a Tobi-Kadachi, you’ll want a gear set that specialises in Thunder defence, but if you’re taking on an Anjanath, you’ll want armor items that protect you against fire. The best hunters in Monster Hunter World will mix and match their gear to create a fairly balanced defense, or change their gear based on which monster they happen to be hunting at the time. You upgrade your existing Monster Hunter World armor at the Smithy in the Workshop, the exact same place at which you forge new armor. Upgrading your armor is a slightly more complex process than forging new armor, as you’ll have to put Armor Sphere items towards upgrading your existing gear. Unfortunately, Armor Spheres don’t come around that often, and you’re rewarded with a single Armor Sphere item for every quest you complete. Therefore, you’ll have to potentially save up your Armor Spheres, as one Armor Sphere doesn’t necessarily equate to one level increase for a piece of armor. Every standard armor item begins at level one, with a predetermined defense rating, which gauges how well protected you are against all monster attacks. Every time you successfully upgrade an armor item, it’ll increase the defense rating of the item by two points. Therefore, you need to choose to either spend your Armor Spheres on lower level items to give them a boost, or save them for when you obtain higher level armor like the Barroth armor, which requires multiple Armor Spheres in order to level up once. 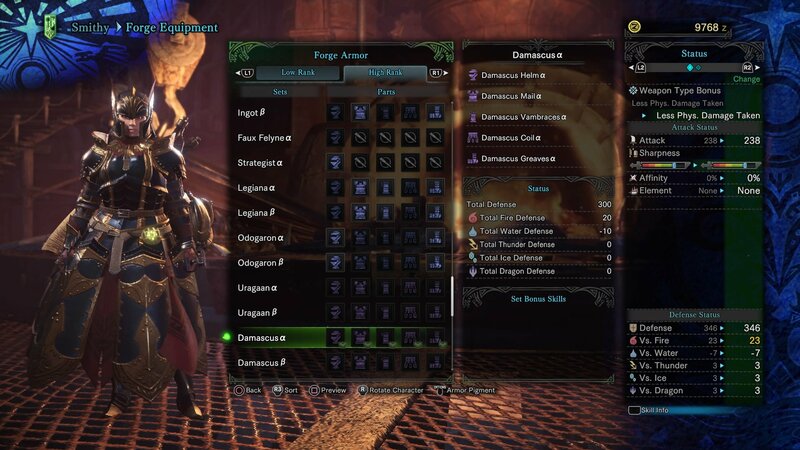 The truth is that there likely isn’t one ‘best’ Monster Hunter World armor set, as every single type of armor in the game has deficiencies in some areas. For example, as powerful as the Barroth armor is, you’ll get roasted (literally) if you go up against the fire-breathing Anjanath wearing it, as it’s an incredibly weak armor set to wear against fire-type monsters. 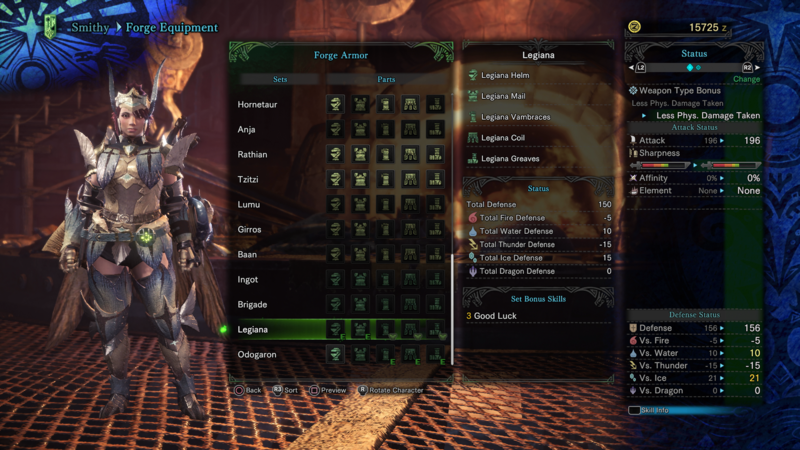 However, with all that being said, we'd recommend one armor set above all: the Monster Hunter World Commission armor set. This armor set simply protects you against every elemental type of attack in the game. 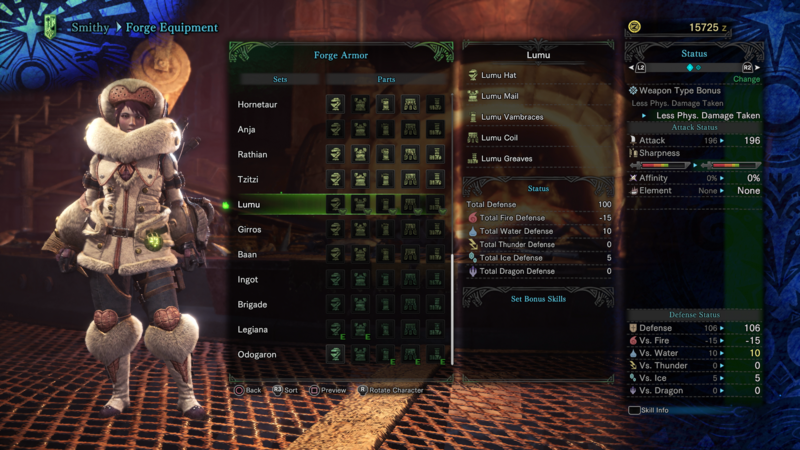 There's nothing flashy, fancy, or hidden to this armor set, but it's one of the more solid, reliable armor sets for simple protection in the entire game. If it looks like you’ve already obtained the very best Monster Hunter World armor, than don’t worry, because there’s a whole lot more to uncover once you’ve sent the Zorah Magdaros back out to sea. After you’ve successfully completed the Colossal Task mission, which sees the Fifth Fleet band together to stop the Zorah Magdaros, you’ll unlock the mission to track a mysterious monster across the Ancient Forest, Wildspire Waste, Coral Highlands, and Rotten Vale. When you get sent out to these locations with the goal of finding track of the ‘??? Rathian’, you’ll unlock the ability to craft High Rank armor in MHW. 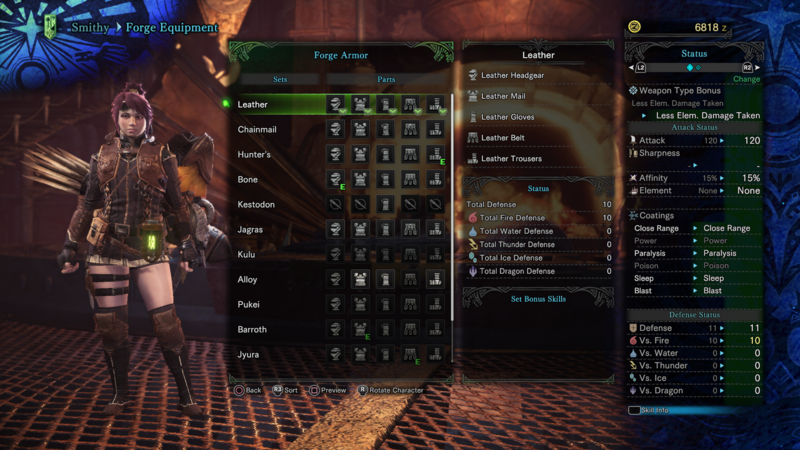 Head to the Smithy in the Workshop level of the Astera hub area, and select the ‘Armor’ option within the ‘Forge Equipment’ menu. You’ll now have a new tab at the top of the page, dividing the creatable armor into two categories: Low Rank and High Rank. It turns out the armor you’ve been crafting up to taking down the Zorah Magdaros has all been Low Rank, and concludes with the Diablos armor set. The High Rank armor basically makes you begin again from scratch, starting with Leather A and B, and Chainmail A and B sets, and working your way up from there, unlocking the ability to craft new High Rank armor sets with each new monster that you defeat. 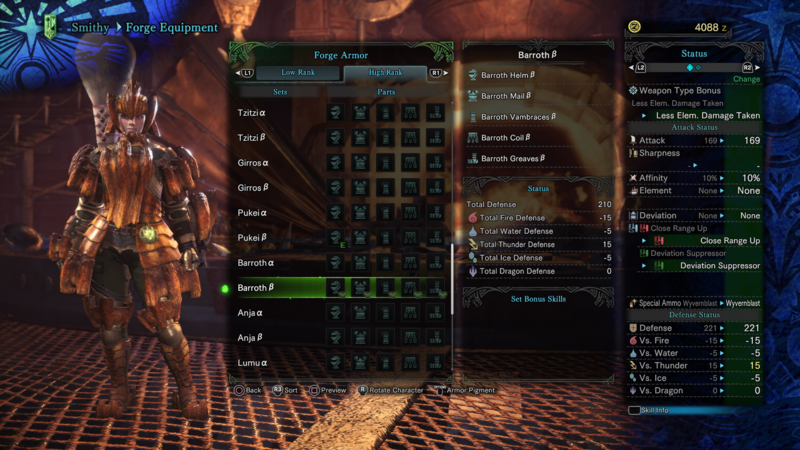 So, if you want to craft the High Rank Barroth armor sets, you’re going to have to venture out and defeat a Barroth in the Wildspire Waste. If you attempt to head out on an Expedition, you’ll now see a new option, similar to that of crafting armor at the Smithy. 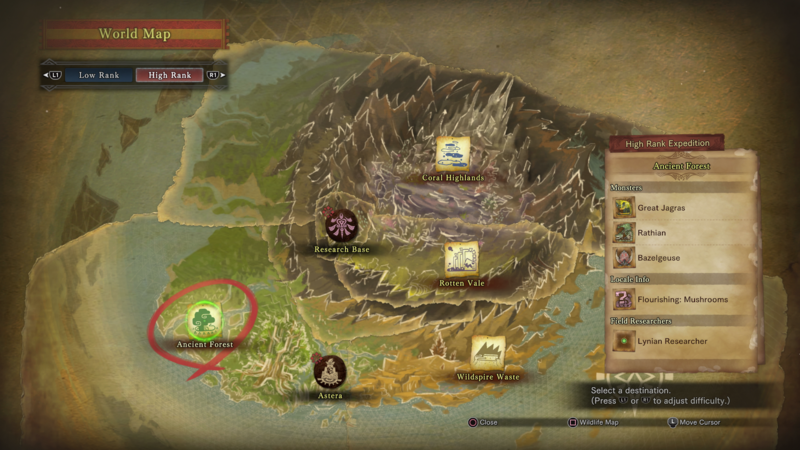 You’ll now see that you have the option to undertake either Low Rank or High Rank Expeditions to each region of MHW, and whenever you toggle between the two options, you’ll see that different monsters are present in the same region. For example in the Ancient Forest, you’ll come up against the Pukei-Pukei, Anjanath, and Rathalos on the Low Rank, and Great Jagras, Rathian, and Bazelgeuse on the High Rank version of the region. We’d recommend venturing out into each MHW region in a High Rank Expedition, to see what monsters you encounter. Try challenging yourself against powerful monsters like the Rathian and Bazelgeuse, and you’ll be rewarded with the ability to craft the corresponding High Rank armor at the Smithy. This might bring an end to our Monster Hunter World armor guide, but head over to our complete weapons guide page, or our guide on taking down the Odogaron.